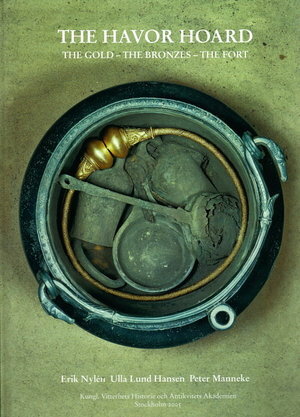 The Havor hoard came to light in Gotland, Sweden in 1961, on the first day of the archaeological excavation of an ancient ringfort, in situ against the inner face of the fort wall. The hoard consists of a gold neckring (torc) in a situla along with Roman wine- serving utensils and a pair of bronze bells. The hoard belongs to the beginning of the first millennium A.D. The neckring is an outstanding piece of craftsmanship. It is argued that it was manufactured in the North, and its connections to the South-east are pointed out. The ringfort was excavated over a number of years, as were the surrounding house foundations, etc. The fort's construction is detailed, and the nearby structures and features placed in context. One of the house foundations produced seven denarii, minted A.D. 112-192. In two shorter papers organic remains in the vessels and bells are analysed. Title: The Havor hoard. The Gold - the Bronzes - the Fort.